The aim of the Cedar Swamp Historical Society (CSHS) Collection Project is to conserve and preserve the collection’s primary materials and to make its contents accessible to scholars, students, and the public at large. 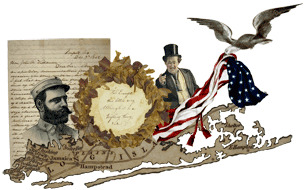 The CSHS collection includes approximately 1100 items dating from the late 17th century through the 20th century that pertain to the American Revolution, the Civil War, the foundations of Quakerism in the United States, and the impact of the Long Island Rail Road on the growth and development of the area. It also includes documents from Long Island’s founding families, rare and signed editions of books from celebrated Long Island authors, an important assortment of bound research materials and related ephemera. The collection was donated to Long Island University in the year 2000 and is housed in the B. Davis Schwartz Memorial Library on the C. W. Post Campus. Roughly 100 signature items from the CSHS collection were selected for their significant historical research value and are the first items to be featured on this dynamic website. The CSHS Collection Project is an ongoing venture begun in 2004 by the Digital Initiatives (DI) Department of Long Island University which was created the same year. The Department is made up of a diverse staff with expertise in art history, library science, archives, photography and multimedia arts. The DI staff, supported by interns and graduate assistants, is dedicated to systematically bringing the University’s signature research collections to their audience, via the Internet. To guard against any unnecessary handling of materials, patrons are welcome to visit the Digital Initiatives Department to examine the staff’s research and study photographs of key materials. When necessary, patrons may make an appointment to visit the collection and examine primary materials relevant to their research agendas.